Today the Enough Project launched The Sentry, an initiative co-founded by George Clooney and John Prendergast that seeks to dismantle the networks of perpetrators, facilitators, and enablers who fund and profit from Africa’s deadliest conflicts. 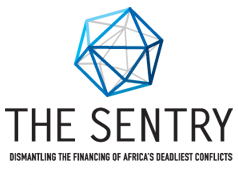 With The Sentry, Enough hopes to lend greater support to broader accountability measures as well as provide leverage to peace efforts aimed at ending Africa’s deadliest conflicts. Using open source data collection, field research, and state-of-the-art network analysis technology, The Sentry will produce evidence-based analysis and focus on how these conflicts are financed, sustained, and monetized. The investigations will aim to engage civil society and media, support regulatory action and prosecutions, and provide policymakers with the information they require to take effective action. Tips or information to share in support of The Sentry's investigations can be anonymously submitted on The Sentry website. Co-founded by George Clooney and John Prendergast, The Sentry is an initiative of The Enough Project, in partnership with C4ADS and Not On Our Watch (NOOW).